When an economy is operating at near full employment and people have money to spend, demand for goods and services increases. To meet the demand, companies expand their businesses and hire more workers. However, at near full employment, most workers already have jobs. So companies have to lure workers with higher wages, which, of course, increases the companies' costs, explains the website Biz/ed. The workers then push for higher wages to meet the higher prices and expected price hikes, which increases company costs again. Theoretically, this continues in an inflationary spiral until a loaf of bread costs the proverbial wheelbarrow full of cash. You'll notice that the behavior of governments and central banks doesn't enter into the story. Apparently a wage-price spiral is a self-fulfilling dynamic process which could start under any conditions and continue forever - unless something is done about it. In the 1970s, some policymakers thought the solution to a perceieved wage-price spiral problem was (naturally) wage-price controls. For example, Richard Nixon tried a 90-day wage-price freeze, and the government of Canada imposed wage-price controls for a much longer period of time. Such controls were advocated by economists like John Kenneth Galbraith, who perhaps wasn't taken so seriously by most academics, but even mainstream macroeconomists such as James Tobin could sometimes find "incomes policies" attractive. ...that the monetary authority go all the way in avoiding such swings by adopting publicly the policy of achieving a steady rate of growth in a specified monetary total. The precise rate of growth, like the precise monetary total, is less important than the adoption of some stated and known rate. I myself have argued for a rate that would on the average achieve rough stability in the level of prices of final products, which I have estimated would call for something like a 3 to 5 per cent per year rate of growth in currency plus all commercial bank deposits or a slightly lower rate of growth in currency plus demand deposits only. But it would be better to have a fixed rate that would on the average produce moderate inflation or moderate deflation, provided it was steady, than to suffer the wide and erratic perturbations we have experienced. Like wage and price controls, targeting of monetary aggregates was tried (in the 1970s and 1980s, primarily) and it failed. The relationships among monetary aggregates, inflation, and real economic activity proved to be highly unstable, causing Old Monetarist prescriptions to work poorly. That doesn't stop the proponents of Old Monetarism -a dwindling breed- from trying. We can still find work involving searches for the elusive ideal monetary aggregate or searches for the elusive stable money demand function. So, if inflation control through money growth targeting works poorly, what to do then? Some central banks opted to target inflation directly or, more generally, there was some recognition that the central bank should take nonneutralities of money into account, and Taylor wrote down a simple rule of thumb that would allow for that. The Taylor rule was subsequently enshrined in New Keynesian models, along with an updated version of the Phillips curve. The American economy, we wrote in July, almost certainly has less room to grow than it used to. Estimates of the economy's potential output, or how much it can produce at a given time without serious inflationary pressure building, have been revised down substantially by the Congressional Budget Office and other economists studying the issue. That was from a piece on potential output in the United States, but what I am interested in is the part about "serious inflationary pressure." Apparently there is more inflationary pressure the lower is the output gap - the difference between "potential" output and actual output. Clearly the writer(s) of this blog post subscribe to a Phillips curve theory of inflation. The Old Monetarists (Friedman) and modern structuralists (Lucas) may have thought they debunked Phillips curve thinking, but it's remarkably persistent. How come? If you think a stable money demand function is hard to find, try to find a Phillips curve in the data. As with the money demand function though, nothing stops a committed Phillips curve adherent. Whether by finding the right combination of inflation measure and output gap measure, judicious use of Bayesian estimation, or whatever, by hook or by crook a Phillips curve can indeed be uncovered in the data. But, as I outline here, it's hard to make a case that the Phillips curve is helpful for thinking about inflation, its causes, and what to do about it. For example, Phillips curves are not useful in forecasting inflation (see this paper by Atkeson and Ohanian.). Diehard Phillips curve folks, in extreme states of denial, will insist that the output gap is a latent variable, and thus the existence of low inflation implies that the output gap must be high. Indeed, from the blog post in The Economist, quoted above, if we take potential output to be defined by the behavior of the inflation rate (as seems to be implied by the quote), we should be able to back out a measure of of the output gap from the actual inflation rate. I'm pretty sure that, if you do that exercise, you will come up with nonsense. But perhaps the Phillips curve - even as complete fiction - has been useful, if for nothing else than to permit agreeement among policymakers. In the recovery phase of a business cycle downturn, supposing the nominal interest rate and the inflation rate are low, an appeal to the Phillips curve can help in obtaining agreement to "tighten," i.e. to raise the policy rate. Even though inflation is low, it can be argued that "inflation pressure" exists, inflation threatens, and tightening should occur before it is too late. Old Monetarists, Old Keynesians, and New Keynesians alike, might find reasons to agree on that. Indeed, I think we can write down models where this would be self-fulfilling, and that type of reasoning - though it may actually be wrong - could yield the right policy decision. The policy decision would be right in the sense that it would avoid the bad equilibrium (bad in the sense of not achieving the central bank's inflation target) that converges to the zero lower bound and low inflation forever - see this paper by Jim Bullard. Today's 10-year German bond yield is even lower than when I constructed this chart - it's 0.95%, relative to 2.375% for a 10-year U.S. Treasury bond. 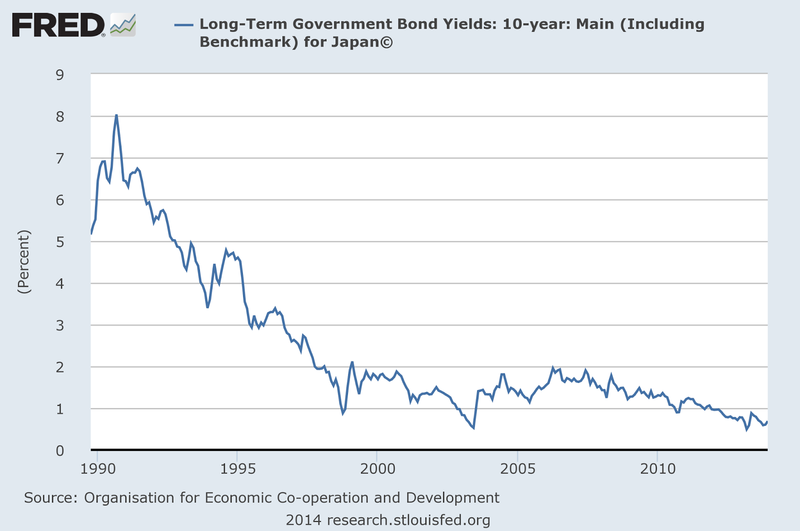 There are some differences of course, for example it took longer for the inflation rate and bond yield to fall in Japan, but the experience is roughly similar. The ECB’s main task is to maintain the euro's purchasing power and thus price stability in the euro area. In case it's not clear to you what that means, there is an explanation here. Apparently price stability means that inflation rates between 0% and 2% are more or less OK, negative inflation rates are not OK, and maybe 1.8% is more OK than 0.8%. Suffice to say, though, that the ECB is changing policy, or about to change policy, on several dimensions, so it appears to think that the inflation you see in the first chart is definitely not OK, or projected to be not OK. Draghi's press conference after the policy change makes it clear that he's worried about a decline in inflation expectations, which you can see in breakeven rates on European government bonds. So, since it appears the ECB wants to increase the inflation rate in the Euro zone, how does it intend to to it? First, the ECB has reduced its policy rates. The interest rate on the ECB's main refinancing operations was reduced to 0.05%, and the interest rate on deposits at the ECB was reduced to -0.20%. The refinancing rate is important, as the ECB does not typically intervene directly in an overnight market as is the case, for example, in the United States, but by lending to financial institutions, and the key lending facility is "main refinancing." The ECB has also taken the unusual step of charging for the privilege of holding reserves at the ECB, i.e. the ECB currently has a -0.20% lower bound rather than a zero lower bound. People - Miles Kimball among them - who think that relaxing the zero lower bound on the nominal interest rate will solve the world's problems get very excited about this. Second, there is a central bank credit program about to get underway, i.e. TLTROs (targeted long-term refinancing operations), which is central bank lending to European financial institutions with attached incentives to encourage these institutions to lend to the private sector. Third, there are planned asset purchases by the ECB - quantitative easing (QE) - with some of the specifics to be worked out later. Again, Draghi answers some questions about this in his press conference. It seems the asset purchases will take two forms: asset-backed securities and covered bonds. A covered bond is basically a collateralized bond, secured by a specified set of assets on the issuer's balance sheet, rather than being subject to the usual seniority rules in bankruptcy proceedings. 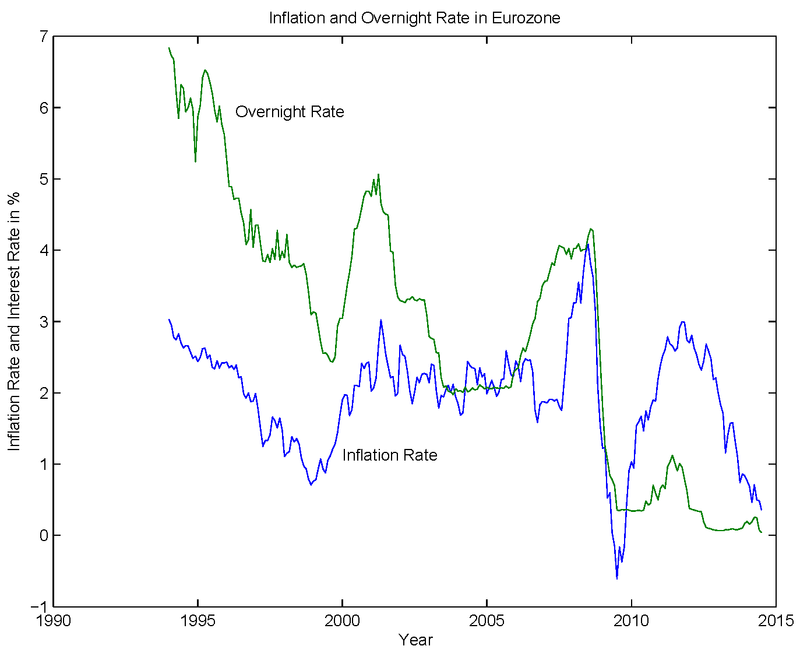 What theory of inflation could we use to think about the ECB's change in policy? Though some deflation-scare stories sound something like old wage-price spriral stories in reverse, let's dismiss that. What about Old Monetarism? It's reported in the press conference that M1 in the Euro area was growing at 5.6% in July, and that wouldn't alarm a quantity theorist, I think. 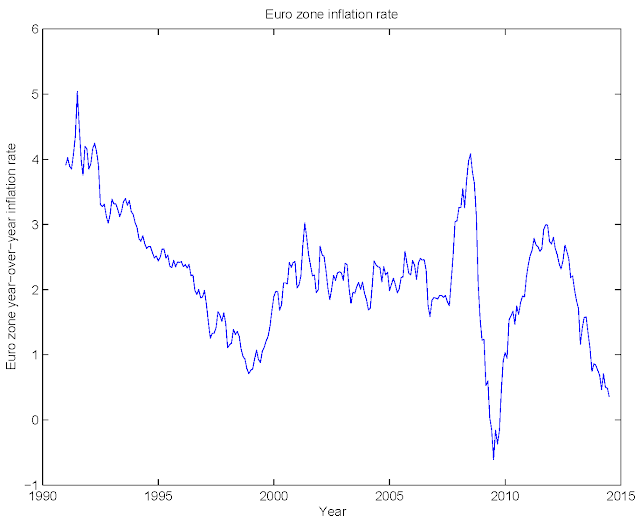 However, belief in the Phillips curve is certainly consistent with what the ECB is doing, or proposing to do. Real economic activity is deemed to be weak, so a Phillips curve adherent might think that has something to do with the low rate of inflation in the Euro zone. Then, if we follow Old or New Keynesian prescriptions, conventional monetary easing - lower nominal interest rates - should increase output and inflation. Unconventional easing (QE and relaxing the zero lower bound) could be added to the Keynesian mix, given the zero-lower-bound problem. But what if we think more carefully about the key elements of the "easing" program? So QE is an outright purchase of assets. To give an example: rather than accepting these assets as collateral for lending, the ECB would outright purchase these assets. That’s QE. It would inject money into the system. Let me also add one thing, because the ABS may sound more, I would say novel, than they are in the ECB policy-making, and indeed, the modality is novel, because we would do outright purchases of ABS, but the ABS have been given as collateral for borrowing from the ECB for at least ten years, so the ECB knows very well how to price and how to treat the ABS that’s accepted, especially since we have, - and this is in a sense another dimension that makes any precise quantification difficult at this point in time - we have narrowly defined our outright purchase programme to simple and transparent ABS. So, you might ask why it would make a difference if the ECB purchases a given asset outright, vs. extending a loan to a financial institution with the asset posted as collateral. Why would there be a bigger effect - and on what - in the first case relative to the latter? Next is the TLTRO. Details of this program can be found here and here. This is basically an incentive program for lending by ECB financial institutions, tied to main refinancing operations - a kind of subsidized lending program. There's no particular link to inflation, unless we think there is some mechanism by which more credit - or credit reallocation - matters for inflation. 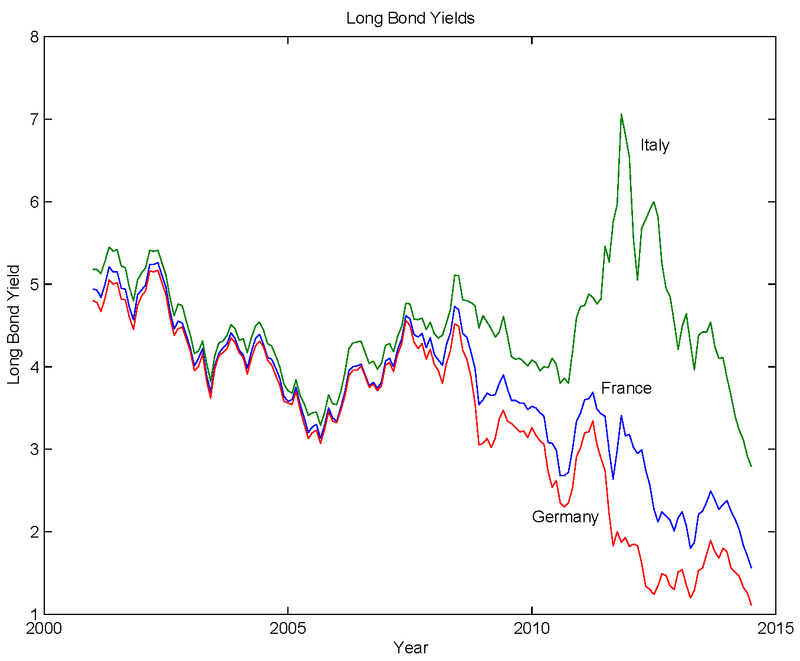 Finally, let's look at the ECB's interest rate policy, which I want to spend some time on. There are two parts to this. The first is conventional easing, which in the case of the ECB is a drop in its main refinancing rate - the rate at which it lends to financial institutions. The second is unconventional - a drop in the interest rate on reserves to a lower negative rate. The key worry here is that the ECB becomes trapped in a state with low inflation and low nominal interest rates forever, and can't get out. 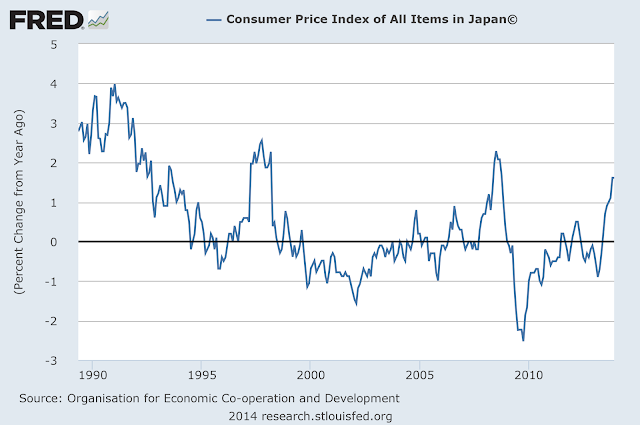 Note that this is a policy trap, not the "deflationary trap" that some people worry about. This is what Jim Bullard discusses in this paper. It's well known that conventional Taylor rules can have poor properties, and can lead to policy traps of this type. If inflation is low, the central bank lowers the nominal interest rate, which leads to lower inflation in the long run due to the Fisher effect. Ultimately, the economy converges to a steady state at the zero lower bound with inflation lower than what the central bank wants, and it can't get out unless the policy rule changes. Further, note that relaxing the zero lower bound won't help. If the central bank charges negative interest on reserves, this only lowers the inflation rate at the low-inflation steady state. 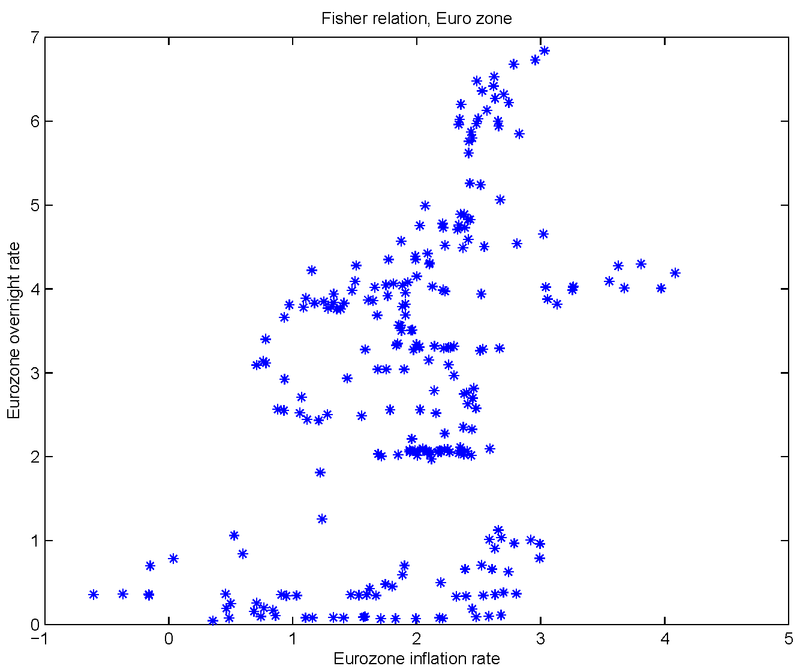 You can see that there is substantial variation in the real ex post interest rate, but the Fisher relation shows up in the scatter plot, just as it does for the United States. Given this, and the first four charts in this post, it might enter your mind that Europe might be going in the same direction that Japan did 20 or more years ago. How could we think about monetary policy in this context? Our goal is to determine what it takes to increase the inflation rate in an economy, taking into account short run effects, and the Fisher effect, which will dominate in the long run. One model that captures some of what we might be interested in is a segmented markets model. I'm going to use it because it's simple, and the key implications may not be so different if we were to include other types of short-run monetary non-neutralities. A very simple segmented markets model is in this paper by Alvarez, Lucas, and Weber. The details of what I did are in these notes that I've posted. In the model, there are many households which each live forever. Each has a fixed endowment of goods each period, and sells those goods in a competitive market for cash. Goods are purchased from other households subject to cash-in-advance. There are two types of households - traders and non-traders. A trader can trade in the bond market each period, and holds a portfolio of money and bonds. Non-traders do not trade in the bond market, and hold only cash. The central bank intervenes by way of open market operations, the result being that an open market purchase of government bonds initially affects only the traders. There is a nonneutrality of money, which comes about because of a distribution effect of monetary policy. An open market purchase will increase the consumption of traders in the short run, and it is the consumption of traders that determines bond prices. Thus, when the open market purchase of bonds occurs, this tends to increase consumption of traders and nominal and real interest rates go down. But standard asset pricing implies that there is a Fisher effect - higher anticipated inflation implies a higher nominal interest rate. In my notes, I work out the local dynamics of this economy. I don't worry about liquidity traps as I'm interested in what happens when the central bank gets off the zero lower bound. If the central bank experiments with random open market operations, it will observe the nominal interest rate and the inflation rate moving in opposite directions. This is the liquidity effect at work - open market purchases tend to reduce the nominal interest rate and increase the inflation rate. So, the central banker gets the idea that, if he or she wants to control inflation, then to push inflation up (down), he or she should move the nominal interest rate down (up). There is no impact effect of the monetary "tightening" on the inflation rate, but the inflation rate subsequently increases over time to the steady state value - in the long run the increase in the inflation rate is equal to the increase in the nominal rate. The real interest rate increases initially, then falls, and in the long run there is no effect on the real rate - the liquidity effect disappears in the long run. But note that the inflation rate never went down. We could add things to this model - liquidity effects on the real rate from scarce safe assets, real effects of monetary policy on aggregate output, etc., and I don't think the basic story would change. The story is that a sustained increase in the inflation rate is not possible unless the nominal interest rate goes up. Further, note that the real interest rate goes up temporarily in the process, and with a more fully developed model, there may be pain associated with that. Of course, in economics free lunches are always hard to find. If we think that higher inflation in the long run is good for us, it's hard to imagine there wouldn't be some cost to getting there. Do you think money demand is relatively stable amongst people but maybe not so stable amongst large corporations and banks which hold most money? I think the key problem with Old Monetarism is that there is some special significance attached to some assets we are going to call "money." It's important, I think, to recognize that the whole spectrum of assets is important in various ways to retail and financial exchange, for credit markets, and for how monetary policy works. Amongst consumers, the nature of retail payments has changed phenomenally in the last, say, 30 years, and of course the payments arrangements among firms and the nature of financial markets has also changed phenomenally. In that context, it would be pretty surprising if the observed statistical relationship among some asset asset total, prices, income, and interest rates, would be stable over that period of time. When inflation goes even lower in Europe, I do not think the ECB will understand the Fisher effect. They will point to demographics. It's a policy trap just like you say. On the inflation trap of the Taylor rule, if you follow the rule, it eventually raises the nominal rate as you approach full employment. The effect is to create a foundation for inflation to rise by the Fisher effect, but also for monetary policy to have short term control of inflation. For instance, the Taylor rule and my effective demand rule are both saying that the Fed should have already raised the nominal rate. Same for Europe. So the rules themselves do not carry an inflation trap. It's when a central bank holds the nominal rate low causing the Fisher effect to dominate which will lower the result of the rule, but the rule will still show that the nominal rate should be raised. It's useful to look at Bullard's paper that I cited above. The academic reference is a paper by Benhabib, Schmitt-Grohe, and Uribe, cited in the Bullard paper. You can construct examples where there is "full employment," but you get stuck at the zero lower bound with an inflation rate below the central bank's target. So part of what you're saying is not correct. I agree with the paper by Bullard in that policy can get trapped at the zero lower bound because it always appears that inflation is too low. And from my perspective on effective demand, it can also appear as if the utilization of labor and capital is too low. But if the Fed had a proper view of slack taking into account effective demand, they would raise the nominal rate sooner. Just a note, the Rudebusch rule looks at utilization of labor to potential. My effective demand rule looks at the utilization of labor AND capital to a composite potential. That is why my rule rose faster than the Rudebusch rule, since capacity utilization rose much faster than unemployment fell after the crisis. Capacity utilization seems to be plateauing. Up to now the market has forecasted that the Fed rate would normalize above 3.5% at full employment, which would give an inflation of 2.0% with a natural real rate of 1.5%. So the policy rules were on track with the Fisher effect. But now it appears that the Fed rate is trapped as we go into full employment. The moment the Fed tries to normalize nominal rates now, the economy can be triggered into a contraction which would keep nominal rates at the ZLB. The market now expects the Fed to be more accommodative than they say, I think because firms know that the business cycle is closing over the next two years. A permanent ZLB nominal rate is not the fault of the policy rate rules which have been calling for nominal rates to rise. The fault is bad timing of policy by the Fed which forces the economy to that undesired steady state in the Bullard paper, where you have low inflation and great slack which makes the policy rate rules prescribe a negative nominal rate. Eventually though the slack is used up and the policy rate rules prescribe a positive nominal rate, as long as inflation and/or the natural real rate do not go too low as a consequence. There is a concern of a negative natural real rate, which I do not agree with. Trying to maintain the real rate lower than its natural level leads to lower inflation. The Bullard paper mentions how constantly low nominal rates enhances the Fisher effect. We know that already. So I understand in theory that part of what I say is not correct, but in practice, it is not easy for the policy rate rules to lead the economy into a ZLB trap. Models to determine slack would be a greater cause. "The story is that a sustained increase in the inflation rate is not possible unless the nominal interest rate goes up." As real interest rates are anything but stable over time the "Fisher effect" is plain nonsense. 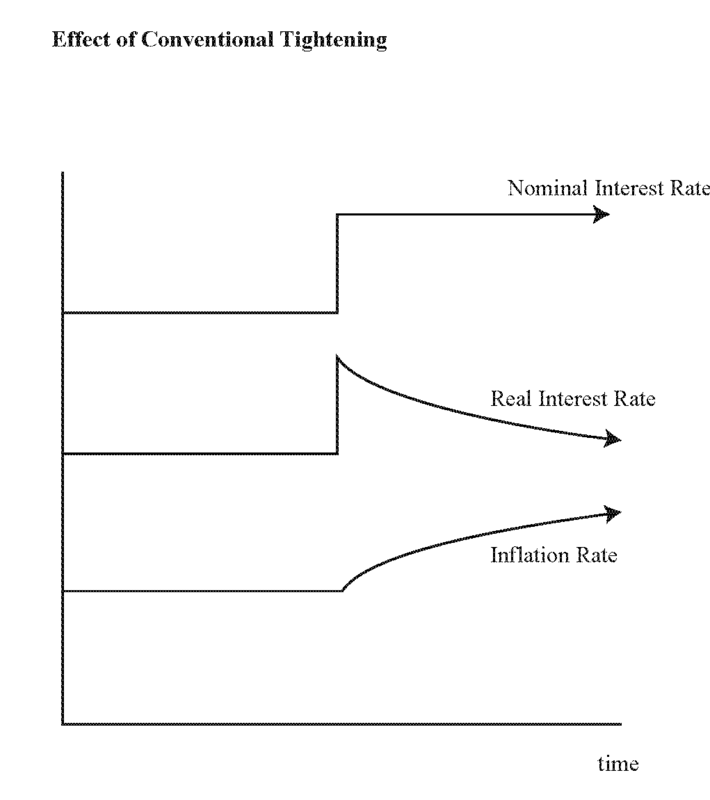 One usually learns during one's undergraduate years to not confuse an identity / definition like "real interest rate equals nominal interest rate minus inflation" with a behavioural relationship. Well, I guess this happens when economist come from a maths background, they mess up even the most basic stuff. "...real interest rates are anything but stable over time"
Sure, but that doesn't mean the Fisher effect is "plain nonsense." It's there in every (serious) theory of interest rate determination that I know about, and it's there in the data. Maybe you have some other definition of "nonsense" in mind. "...economist come from a maths background..."
Strange that you would think of me this way. I have an undergrad degree in math - from 1977. I don't think any mathematician would think of that as much of a "math background. Maybe you are suspicious of math in general. If you are actually an economist, you should probably find another profession then. Clearly Anonymous above comes from neither a math (not maths, you illiterate) nor an economics background, as he is an idiot. Well, there are plenty of people with math and economics backgrounds who fall short on the IQ scale. At least he didn't cite his favorite Stiglitz paper again! I appreciate that nobody adressed my point, that identities and behaviourla relationships should not be confused (when your opponent goes ad hominem you knew that you already won the argument respectively that the other side does not have any argument in the first place). There is of course a Fisher effect in the long-run if you assume that real rates ar stable over the respective time horizon ... and I fail to see why real rates should be stable over a period of years or decades. Not in that model. It leaves all kinds of things out. I wasn't intending this as a complete model of anything. Just wanted to illustrate one point. Fiscal policy and its interaction with monetary policy is important of course. Steve, the prediction of your model seems to contradict experience during the Volcker disinflation. I am being a bit lazy for asking, but what is the difference between the model and what happened then? That the increase in the interest rate was not permanent? That the nominal interest rate was already high? Something else? And why? The Volcker disinflation has the nominal interest rate going up for a short while, then going down. You would have to run that through the model and see what happens. It could work, I think. Volcker raised the Fed rate in order to manufacture an artificial "natural" real rate of 6%, which was higher than the true 3% natural real rate at the time. The effect was to keep the economy from reaching full employment where you would have seen the natural Fisher equilibrium. The manufactured high 6% natural real rate was incorporated in the dynamics of the Fed rate. Then as the Fed rate came down, inflation also came down due to a firm 6% real rate. Once inflation was under control, the Fed rate incorporated a natural real rate of 3%. What we have now is the opposite... the real rate is being held lower than its true natural rate. So we have an artificial "natural" real rate around -1%. So the intent is to push the economy to and beyond its natural level. The idea of overshooting. It is possible to keep the economy from reaching its natural level as Volcker showed us. In my opinion, however, it is not possible to push the economy beyond the true natural limit of output and effective demand with an artificially low real rate without destabilizing consequences. In "Apparently there is more inflationary pressure the higher is the output gap", "higher" should be "lower". The closer to potential output, the higher the risk of inflation (according to the "wage-price" spiral theory). isn't the gap symmetric about Y* ? There's an issue that's been bothering me. You've pointed several times that lowering the nominal interest rate (ussualy the Feds Funds Rate) leads to a lower inflation due to the Fisher effect. What I can't grasp is how the causality goes; does a low nominal interest rate lower inflation to go down or does a low inflation lower the nominal rates? I undestand that the FED controls the Funds Rate, but is it the relevant rate for public's decitions? I live in Argentina and we've had negative real interest rates for the last five years, mainly because our Central Bank won't stop printing money to finance debt. How does the Fisher effect work here? In the notes of mine that I link to above, I give an example of how it works. Read that, and let me know if you have questions. I believe that the right answer is that prof Williamson's model is incomplete and makes a few incredible assumptions. For incomplete, I mean that there is no external sector. If one adds an exchange rate and an external sector, it is easy to show that low interest rates will generate inflation - as you well and rightly know as an Argentinean. For incredible, professor Williamson assumes a stable ex-ante long term real interest rate which pins down the equilibrium. I suggest you look at the fiscal theory of the price level when it comes to Argentina. Perhaps the Argentinian government could no longer increase the sum of its future surpluses, so, since it refused to slow the growth of it's debt, inflation must have occurred. Low nominal interest rates do not explain a highly negative real rate, fiscal policy might. I am a regular reader of your blog, and I enjoy it very much. Quick question: I just don't understand why you (and others like Andolfatto) every now and then cite the non-refereed Min Fed paper by Atkenson and Ohanian while ignoring the well known and widely cited Stock-Watson papers on the (limited?) usefulness of PCs for forecasting inflation. Would love to hear from you. I reference what I know. I have not read the Stock-Watson work. Why don't you give me the references? Sure, fair enough. But SW have done serious work on inflation dynamics, including some using PCs. It seems surprising to me that there is no mention of their work. Another point is that the tacit dismissal of the PC based on its poor forecasting record reminds me of unwarranted calls for dismissing macroeconomics altogether (or DSGE models) for its poor predictive power ("it's hard to make a case that the Phillips curve is helpful for thinking about inflation, its causes, and what to do about it. For example, Phillips curves are not useful in forecasting inflation"). So if someone finds that mainstream macro is not useful for predicting important economic turning points or crisis, should we start looking for insights elsewhere? Astrology or geology? (Joking). Just to recap, I really like your blog, and I just wish I wouldn't feel hints of bias against mainstream* work that you don't seem to like (PCs and NK-PCs, NK models, price stickiness, etc). Please see some easy-to-find references below. Let me know what you think of them, they are not particularly of PCs but they tackle the issue of forecasting head on, without any fluff. * mainstream is refereed stuff that ends up in the JME, for example. You know what I mean. 4. Modeling Inflation After the Crisis (with James H. Stock), FRB Kansas City symposium, Jackson Hole, Wyoming, August 26-28, 2010. "Another point is that the tacit dismissal of the PC based on its poor forecasting record reminds me of unwarranted calls for dismissing macroeconomics altogether (or DSGE models) for its poor predictive power..."
People base policy decisions on the PC's forecasting power. That would be a problem, don't you think? But if someone criticizes a model that was not intended for forecasting purposes, because it does not forecast well, that would be inappropriate, right? I hope people (CBs?) base their decisions on more than PCs or any given macro model. Frankly, I am not sure what is the real point in your reply, and I agree that it would be a problem to base policy decisions on PCs (or a single macro model, whatever that may be). And of course it's ok to criticize any model, particularly those that are used for policy and don't forecast well. My original point is that the criticism appears one-sided, and since I enjoy your blog posts, I would love to hear from you "updated" criticism in light of the evidence discussed in SW's papers. Let's not forget you are/were a prof, and Carl Walsh and J Gali have well-known books that discuss NKPCs in detail and there is no mention of them in your entry. But I agree, one should reference what one knows. I just happen to think that you know better than what is portrayed in this particular blog entry. Hopefully I am wrong about that. I also hope you take a look at the SW's papers and let me know what you think. If we take the PC seriously, a credible announcement by monetary authorities that they are planning to raise the money supply 10-fold, for example by adding a zero at the end of every dollar bill will induce firms to hire more people and produce more, and only raise their price after the economy has reached what is considered full employment. Stock and Watson will have to show me a lot of regressions to convince me that, even in today's economy, producers would simply not add a zero to their price tags in response, and keep producing the same as before. Not really. I think you are saying non-sense. If the central bank adds a zero to every dollar bill, it is clear to any economist who rightly recognizes the empirical success of the Phillips Curve that prices should increase by 10 times. I am still unclear on the causal mechanism whereby higher nominal interest rates induce increases in the inflation rate. While the correlation is clearly present in the data, and implied ex post by the Fisher relation (given a fixed rate of real interest), I cannot wrap my head around a causal impact of higher rates that results in higher inflationary expectations. If the fed raises rates today, wouldn't borrowers and lenders anticipate LOWER future rates of inflation (since the market consensus is that policy tightening is associated with Fed desire to cool nominal growth rates)? Is it not possible that the correlation observed in the data is due to an de facto execution of a Taylor rule in monetary policy, and thus only relevant ex post (offering no special ex ante insight, e.g. raise nominal rates today to increase inflation tomorrow)? Suppose the Fed correctly anticipates near-term rising inflation, with perfect forecast accuracy, and responds every time by putting upward pressure on short-term nominal rates. Then we would observe the same relation (stronger, in fact) in the data, but for all of the wrong reasons. "If the fed raises rates today, wouldn't borrowers and lenders anticipate LOWER future rates of inflation..."
They might, and you might, but I'm saying that could be wrong. Sure, they might; I agree with you. The effect on future inflation of rate policy changes today is confounded by the long-run effects of rate policy changes yesterday, and the two are often at odds. None of this, however, goes to why raising interest rates today would cause higher inflation tomorrow (in any run), ceterus perebus. Can you provide some insight into why? Jason appears to have tried to tell a story below, but I admit to finding it no more illuminating than the above. The arguments hinge entirely on the identities, which are ex post constructs. Under what theory of money does "easy" monetary policy "induce" deflation (and vice versa)? I would argue that the ex-post relations hold because the nominal rate cannot drift far from the real rate (in fact, it is long-run constrained precisely by the unobserved rate of inflation). Efforts by any central banking authority to induce the same are destined to break down, as market forces dominate. Thus, in the ex-post long run, we have an apparent Fisher relation. However, the mechanisms a central bank employs to either raise or lower nominal rates subject to inflation targeting are themselves either independently inflationary or deflationary, in the short-run (if that makes sense). The bank strives to constrain its activities to the realities of the market, however, lest it lose control. To the extent that this is the lesson of the Fisherite story, so be it. To the extent that it isn't, I'm unconvinced. The following was offered by another commenter on another forum; I have stolen it as apt. Glenn, I see you've read Jason's link. You might try asking him on his blog... he's very helpful about explaining his ideas. Tom Brown has a weird obsession with this weirdo crackpot. 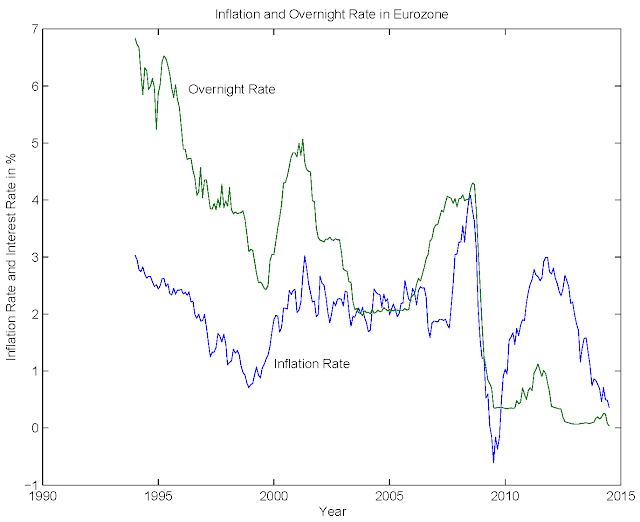 I think the effect is implicit in the changing relationship between the monetary base and inflation. When the base grows and inflation doesn't, you get a falling interest rate. When the base grows and inflation follows, you get an increasing rate. That's an example of a model with a liquidity effect (random "easing" in the usual sense makes the nominal interest rate go down). 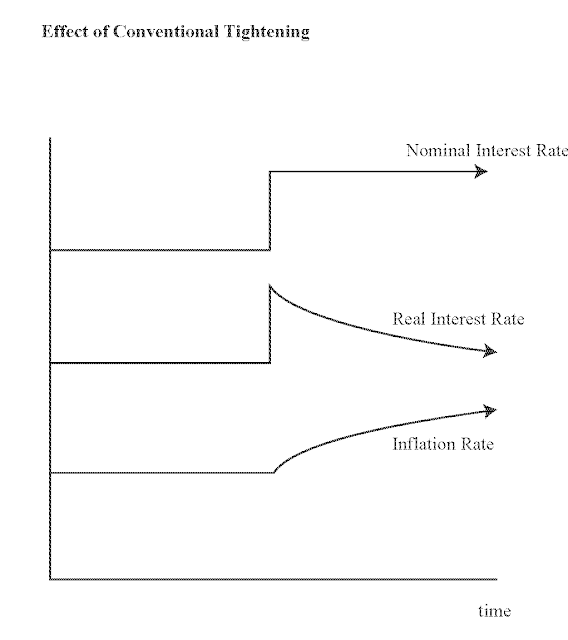 But a simple experiment where the nominal interest rate goes up once and for all implies increasing inflation over time to the steady state. It's really not mysterious. so I'm very interested in the Fisher effect and seeing if it has the same behavior in a real economic model as it does in my "heterodox" model.